It's Imbolc, and that's the Sabbat where many Pagans choose to honor the Celtic goddess Brighid, in her many aspects. However, other than having a giant statue of Brighid on your altar, there are a number of ways you can set up for the season. Depending on how much space you have, you can try some or even all of these ideas–obviously, someone using a bookshelf as an altar will have less flexibility than someone using a table, but use what calls to you most. Traditionally, the colors of red and white are associated with Brighid. The white is the color of the blanket of snow, and the red symbolizes the rising sun. In some traditions, the red is connected with the blood of life. Brighid is also tied to the color green, both for the green mantle she wears and for the life growing beneath the earth. Decorate your altar with a white cloth, and drape a swath of red across it. Add green candles in candleholders. Karalynn is a Celtic Pagan in Virginia. She says, "I'm a quilter and cross-stitcher, so I've got a quilted altar cloth I made in colors that represent Brighid–it's green and red and white, and the the stitching is gold. I also have a cross-stitch piece I made that's a sampler of a Gaelic poem honoring her in her role as a goddess of hearth and home." Altar decor should reflect the theme of the Sabbat. Because Imbolc is a harbinger of spring, any plants that symbolize the new growth are appropriate. Add potted bulbs–don't worry if they're blooming yet–and spring flowers such as forsythia, crocus, daffodils, and snowdrops. If you don't have much luck planting bulbs, think about making a Brighid's crown as a centerpiece–it combines flowers and candles together. Brighid is, after all, a goddess of the Celtic peoples, so it's always appropriate to add some sort of Celtic design to your altar. Consider adding a Brighid's cross or any other item incorporating Celtic knotwork. If you happen to have a Celtic cross, don't worry about the fact that it's also a Christian symbol–if it feels right on your altar, go ahead and add it. 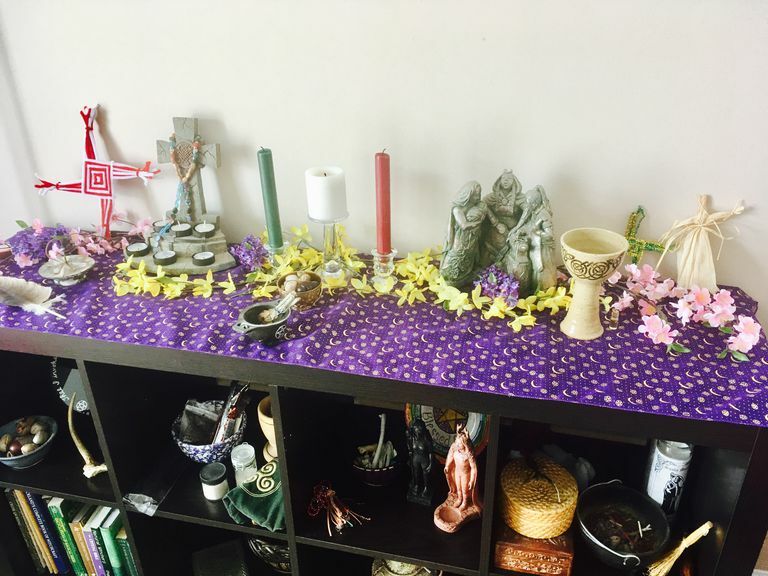 Be sure to place your altar in a spot where you'll be able to see it and work with it–even if it's just a quick acknowledgement–during the Sabbat season.